Without an engine, your powerboat — or your sailboat on windless days — becomes nothing more than an oversized rowboat, and let us hope that you will never have to paddle your twenty-footer three miles back to its mooring. An outboard motor, if you need one, is likely to be the most costly and complicated part of your boat, and your choice must be made with a variety of factors in mind. Before you do anything else, check your boat for the National Marine Manufacturers (NMMA) plate, usually located on the inside of the stern. Along with other useful information, the plate will tell you the minimum and maximum horsepower rating for your hull. If your boat is not NMMA-certified, check with the manufacturer to ascertain the hull’s rating. 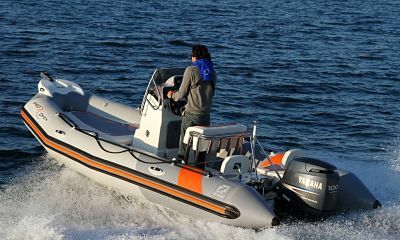 It is absolutely necessary when buying an outboard motor to stay within the minimum and maximum horsepower rating. An engine on the wrong side of the rating, whether past the lower or upper limit, will endanger not only the integrity of the hull but quite possibly the lives of the people aboard. Once you have found the horsepower rating, it is a good idea to calculate the number of people and amount of gear that you will have aboard for a typical trip. If you normally boat by yourself, for example, buying a less powerful engine will save you money on fuel, but if you usually have five of your buddies on board then you need something powerful enough to keep you all at speed. One more consideration is where you will be using your boat. Boating on the ocean requires a stronger engine, while boating on a comparatively calm lake calls for a motor that will not shake the birds out of the trees. Once you have completed these preliminary steps, it is time to take a look at different types of engines and what they are suitable for. There are two types of outboard motors: two-stroke and four-stroke. There are many differences between the two, and a few of the key ones are noted here. Two-stroke engines are usually lighter at the same horsepower than four-stroke engines and therefore have a good power to weight ratio, but many of them do not meet emissions standards. Two-stroke engines operate using a mixture of gas and oil, while four-stroke motors use only gas. Four-stroke engines are quieter, and since the oil is added to the engine and not to the fuel like in a two-stroke, they have better fuel economy. These are the main differences between the two engines. Another factor in fuel consumption and use is the type of fuel injection that the motor uses. There are three types of fuel injection, explained in the next section. The three types of injection are Direct Fuel Injection (DFI), Electronic Fuel Injection (EFI), and carbureted systems. Carbureted systems have been around the longest, and they work by controlling the amounts of airflow and fuel that get into the engine. An EFI system uses electronic systems to control air and fuel intake, while a DFI system — as the name implies — injects fuel directly into the cylinders of the engine. Carbureted systems are the most inexpensive, but this initial advantage is soon overshadowed by the fact that their fuel economy is inferior to both DFI and EFI systems. The considerations above are in great part a matter of personal choice. Much of the choice of horsepower, however, is predetermined by the type and size of your boat. You have some wiggle room, depending on how fast you want to go, how much you want to pay for fuel, and how many people you plan to have in your boat, but once these calculations are made your choice will be very straightforward and easy. If you are purchasing a motor for a small boat such as an inflatable, a dinghy, or even a canoe, you will not want to exceed about 10 horsepower, depending on the exact type of the boat. This horsepower range is also useful for smaller sailboats, as sailboats have no need to go as fast as powerboats. These types of engines are often ideal for lake boating, or boating in waters that are always relatively calm. At this horsepower, the amount of weight you have in the boat will make a powerful difference to your speed, so really think about what you will need before you purchase. If you are using boats around 10-15 feet in length, such as aluminum or fiberglass boats that are relatively lightweight and do not need a huge amount of power, an engine in the 15-20 horsepower range should suit your needs quite well. These engines are powerful enough to get you where you need to go if the distance is not too great. Also keep in mind that in many cases these engines are still best for lakes, as they do not have to compensate for the bumpy ride over the swells. For boats of lengths between 15 and 25 feet, the range of options is fairly large, depending on the build and purpose of the hull. Boats and skiffs used for coastal fishing and excursions may be run with engines of 75 to 90 horsepower, while boats of similar lengths that need faster speed and travel further may need horsepower of up to 300. If your boat is over 25 feet in length, a popular choice is to have twin outboard motors on the stern, usually in the range of 200-300 horsepower. This extra power is necessary for boats that travel far offshore, especially if they are to spend time fishing or other such tasks — you need to be able to get there quickly and return to harbor before nightfall. If you have a sport boat, even if it is less than 25 feet, your horsepower will probably be in this range. If you have a larger sport boat and plan to use it for its intended purpose often, you are looking at a probably range of 300 to over 400 horsepower. The most important thing to do when choosing an outboard motor is to make sure to do your research and think about your boat carefully. Prepare properly for the use will boat will see, and your engine will last you a good while into the future.